Holiday.gr - ASTIPALEA, a trip to a myth! 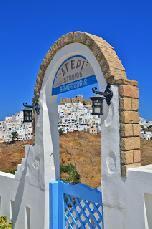 Been to ASTIPALEA ? Share your experiences! Astipalea is a special island with long history and tradition. As the ferry reaches its port, the visitor sees this uniqueness. The island’s peculiar shape, is the first picture that impresses travelers. Almost in the center of the island, the land gets narrow and seems like dividing it into two pieces. This narrow strip of land with a width of 100m brings together southwest and northeast Astipalea. 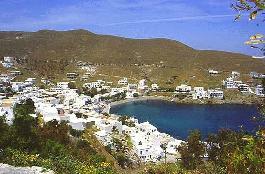 It is the most west island in Dodecanese and the closest to Cyclades. Only 23n.m. to Anafi. This contiguity has effected residents’ culture. Something that is shown in the architectonic structure of settlements. It combines in a unique way the island architecture of Cyclades and Dodecanese with the nobility of venetian architecture. The result of all this is outlined in the enchanting picture of Chora. The venetian castle, the windmills, the churches and white houses, common pictures of every Aegean island, still enchant foreign travelers. In Astipalea you will enjoy the clean beaches, water sports and walks in the graphic paths of the town. Despite al that options for entertainment are many. You will find lots of bars in Chora satisfying all music preferences. Many interesting cultural events are also organized. As for accommodation, hotels and rooms to let provide a pleasant staying. Schedule your holidays in the enchanting Astipalea and live unforgettable moments in this Aegean paradise!